The Prescott Iris Society established the Dykes Medal winners garden at the Yavapai College Sculpture Garden in 2010. The purpose of this planting is to show the progression in size, form, color patterns and growth habits of iris from the early 1920’s to the present. The Dykes Memorial Medal is recognized as the highest award bestowed on an iris by the American Iris Society (AIS). The Dykes Medal is awarded to no more than one iris per year. An iris remains eligible for a Dykes Medal for three years following the winning of one of the Special Medal Awards. Only AIS registered judges may vote for award winning iris. 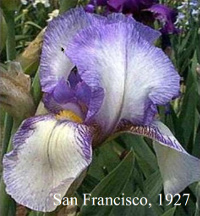 The award was first presented in 1927 to 'San Francisco' hybridized by William Mohr. William Rickatson Dykes, 1877-1925, a prolific British author, botanist, hybridizer and horticulturalist became the world’s leading authority on iris in the early 20th century. His many observations about the genus iris were widely recognized as groundbreaking information. He wrote the definitive book, The Genus Iris, published by the Cambridge University Press in 1913. 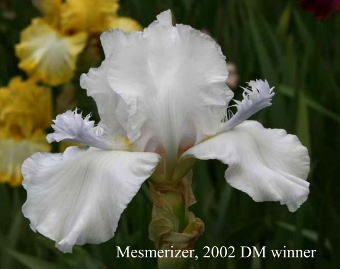 After his untimely death, The British Iris Society resolved to award a medal to the hybridizer of the outstanding iris variety of each year in memory of Mr. Dykes and thus the Dykes Medal was created. This medal is awarded in the United Kingdom, New Zealand and Australia and the United States. Dykes’ complete biography can be found on the Historic Iris Preservation Society website. Photos of all the Dykes Medal Winners are available on the AIS Wiki.